Min Young brought some ramen for me when she visited Malaysia, Shin Ramen products. 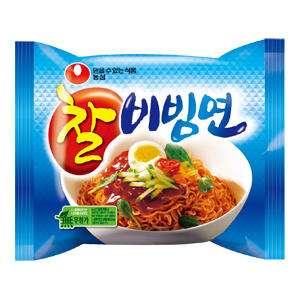 But I couldn't eat it as I found there is 돈지(돼지고기) in the ingredient. I know what is 돼지고기 dwaejigogi - pork, but I don't know what is 돈지. So, I brought all the ramen and gave it to Yong Soo when we studied Korean. He told me that 돈지 is pork bone. I asked him whether I could eat Korean ramen at all and he said I'd better not as he is pretty sure that all type of ramen in Korea has traces of pork in it. Check the ingredient list here. This is Bibimmyon. Like bibimbap but bap/밥 is rice and 면/myon is instant noodle. 비비다 / bibida means mix or rub together. So, naturally 비빔면 means mixed instant noodle. 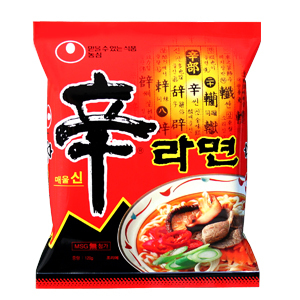 ^^ This one also has traces of pork in the seasoning/sauce although it is not stated in the web as in here but I found it behind the packaging. Just fyi, if you could read the ingredient list, it stated 팜유(말레이시아산), 팜유 / pamyoo means palm oil and 말레이시아 / Malleisia is Malaysia. I guess 말레이시아산 means 말레이시아산업개발청 - Malaysia Industrial Development Authority?